In the Minecraft world each of the tools can be made with 5 different material types/colors. Diamond includes shades of teal, Iron includes shades of white, Stone includes shades of grey, Gold includes shades of yellow, and wood includes shades of brown. I'll be showing you one of the color combos per tool. The handles are all the same. You can swap out the colors for the top as you like. I'm not a Minecrafter, but my 12 year old daughter loves the game. 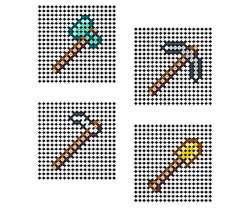 I thought the pixelated images would be great for Perler Bead crafts, fuse beads of any brand really, so I made these templates in Photoshop. You can dig dirt, sand, and gravel by hand. You can dig faster with a shovel. You have to dig to find ore.
You can chop wood with just your hand. You can chop it faster with an axe. You need wood to make tools. Once you make a wooden pickaxe you can mine stone. You need a stone pickaxe to mine iron. You need an iron pickaxe to mine gold and diamonds. You till dirt and grass with a hoe to get wheat seeds and prepare for crops. When your tools wear out you'll have to make a new one. Diamond tools work the best and last the longest but diamond ore is hardest to find. You don't want to waste diamonds so only use them to make a pickaxe. The pickaxe is the most important tool. You can use gold to make better things than tools so don't waste it either. Stone or iron works well enough for axes, hoes, and shovels. PDF includes Axe and Hoe templates. PDF includes Pickaxe and Shovel templates. The 2 PDFs I've linked to above are for 8 1/2" x 11" paper. There are two patterns on each sheet. When you print them full size you should be able to place them right under a clear or transparent pegboard and place the beads right on top. You could also use an opaque board and just eyeball it. And there you have my 4 made-from-scratch Minecraft Tools Perler bead patterns. Every little colored circle was filled in one at a time by yours truley. Want to make a Diamond Pickaxe instead of the Stone one I showed? Or a Wooden Shovel instead of Gold? No problem. Swap out the colors in the examples above with the ones for your chosen material. 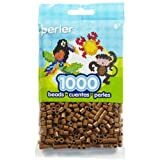 1,000 light brown fuse beads. 5 basic shapes in varying sizes. Includes 1 large square, 1 circle, 1 heart, 1 large hexagon, and 1 star. Which Minecraft Tool is the Coolest?